The reason modern Hindi songs lack the nuances, the twists and the folds of older numbers is simply that life itself has lost them. You cannot divorce poetry from life, and when life has grace, pain, fortitude, gentleness and a value system, poetry has them too. Today’s life, unfortunately, is all straight lines: clean-cut, neatly shaven, and artificially perfumed â€“ and so todayâ€™s music is either just technical or cynical. In the days gone by, though, grace in daily life was important; restraint was important; bearing was important. Therefore, the poetry of those days was beautiful too. I cry when I hear good poetry. Do I cry because the words are lovely, or because I yearn for a day when life is not so rushed, and there is time for politeness? Itâ€™s not that grace and fortitude did not have a negative aspect to them â€“ people had to live with some problems simply because tradition demanded that they grin and bear. This allowed for the creation of pathos-filled situations in many Hindi movies â€“ it did not require villains!! Palki, made in 1967, was one of them. Set in Lucknow, against the backdrop of its graceful and yet hide-bound Muslim culture, the story of a talented poet who would not sacrifice his dignity for money was the perfect setting for good poetry, set to great music and some mesmerizing singing. This poet, faced with unimaginable pain, shows a capacity for tremendous stoicism. In those days, a decent man was not one who won a battle, but who could show fortitude in the face of pain. One such song in Palki exemplifies this courage; it is steeped in pain.Â Shakeel Badayuni wrote the lovely verses; Naushad gave it life, and Rafi saab immortalized it with the able support of two Rehmans on screen (one, the powerful male presence, and the other, Waheeda, the queen of grace) and was successful despite Rajender Kumar’s usual absence of histrionic ability. â€œkal raat zindagi se mulaaqaat ho gayiâ€ â€“ thatâ€™s the first line of the song. Today, it would be unmanly to dwell on the memory of a dead wife. In the times of the movie, there was no pride lost in wasting away because of the grief of widower-hood. When he (as he thinks at that time) sees his wife’s ghost, he comes face to face with what he is all about – his obsession, his grief; and how ironic, that a ghost should be described as “zindagi“, or life. Shakeel managed to tell an entire story in one that one line â€“ and that was simply because people at that time lived an entire lifetime in one moment. In those days, speechlessness was the language of the heartâ€¦and silence was eloquent; if a man, with trembling lips, could manage to say something to his beloved, he was not considered any less: it was the quintessence of manhood to be hesitant in love. That was the music Shakeel wrote and Naushad scored. And which Rafi sang with such feeling. When I cry as I listen to these words, am I crying for the beautiful words? For the heartrending music? For Rafi’s soulful rendering of the song? Or for the loss of our essential guidance, for the loss of our grace? For the loss of true manhood, that can be unashamed of grief? I can tell you this: if you can capture the spirit of those precious moments, live them fully – you don’t need any more. I’d rather have five minutes of reality than an eternity of ideology. Listen to how Rafi, the master, sings these lines. He screams in agony, melodiously! Screaming in deep agony is a cry of the heart â€“ whereas screaming with dissatisfaction is a tantrum. The former is musical, the latter is piercing, in your face, and unpleasant. Only Rafi could bring out the inherent melody in piteous grief; because he was telling a story with his voice, and not merely singing a song. Why do I cry when I hear these lines? Is it Rafi’s voice alone? Or is it because of the story of the heart he’s telling? Or am I missing that value system that values experience over accomplishment? Naushad finishes the song with a characteristic flourish, emphasizing the drama of the situation in the movie, but I am left with tears in my eyes. I don’t know what I cry for…for the beauty of the poetry, for the soulfulness of the music, for the incomparable singing, or for the times when life was not ruled by a Blackberry, it’s red light signifying the arrival of yet another mail or message, of the need to stop savouring the moment and lurch towards the next – blindly, pointlessly. This entry was posted on Sunday, May 17th, 2009 at 4:32 pm	and is filed under Meri Awaaz Suno. You can follow any responses to this entry through the RSS 2.0 feed. You can leave a response, or trackback from your own site. Thanks you very much ofr the kind words. Vinatha, yes, that it is a Waheeda song made it extra special! Narayan ji, you hit the nail on the head!! Siva saab, glad that the review enhanced your enjoyment of the song!! Anil ji, thanks for the link, much appreciated. What terrific writing. Please accept my compliments. Do keep on writing. Although I had listened to this song earlier , yesterday , after reading your excellent article I listened to this song and could really appreciate the beauty of this gem in a much better way. The antara appears to be deceptively simple but is really difficult to sing. Rafi sahab , Naushad & Shakeel have put in their soul into the song and you have made us all appreciate this by your well researched article. Thanks a million for enriching our musical journey in exploring Rafi sahab. Without any iota of exagerration your wonderful review should be learned by the youth of today and especially those interested in vintage Classics. It is a shame that no TV channels gives importance to song lyrics..of vintage era except perhaps the good old Doordarshan. May you give us avalanche of reviews to fulfill the cherished desire of all Rafi Lovers. Bahut shukriya…….very kind words indeed!! very very nice.Its been a real treat reading the review and this song was such a fav. that I remember going and buying the LP.The song was special because of Rafi and Waheeda.I had the song playing while i read the review so it was special. Dear Mohan:I have been trying to send this for the last three days but some problem with the site it is not recording it. My last attempt. Your brilliant commentary on this great song by the parallelless creative combo of Naushad/Shakeel/Rafi made me cry.Now I do not know whether I cried because of this ‘creation’ extraordinaire,or because such geniuses no longer tread in this world,or because of the literary flavour with which you had written this piece or because I was lamenting the fact that people no longer understand,experience and live beautiful poetic works as you have done. Thanks for this lovely post,Mohan. Many thanks for all your kind words. Not replying separately to each of you, but I am overwhelmed. Utthara, that was very elqouent praise!! Thank you. Your description of the beauty of the old and the relative lack in the new made wonderful reading! Anwar saab, point taken on the embedding song bit…and thanks for your kind words. Guru ji, great gyan as usual….always richer when one reads your wriitng! Anoopbhai, others, thank you so much! Girish ji, your comment on the “soul / sole” – good one! congratulations for a passionate article on one of the most soulful songs with the perfect blend of soulful music, soulful lyrics and of course soulful singing. The songs of today are mostly made for the shoe sole rather than the human soul. aptly portaryed in your excellent article. We know your writing prowess and now I am sure the Rafi bhakths from this site will be really treated to a feast of articles from the MIGHTY MOHAN pen. Congratulations! You have captured the essence and depth of this beautiful song, fabulous lyrics so well. Rafi Saab and only Rafi Saab could have done justice to this song, and probably, only you could do justice to the tribute paid to this masterpiece. That was an excellent artilce. I want you to write more. Cannot explain in words and sentences how well this article has come out from you..congratulations. Please bring out more such articles from your heart out!! What a song? Except Rafi, no other Singer could have done justice to this song. Music by Naushad and lyrics by Shakeel were simply great. Though the antara was unusually long, still Rafiji could maintain the melody and pathos through out. 1. Dile Betaab Ko – Rafi & Suman. 2. Main Idhar Jaun Ya – Rafi, Asha & Mannadey. 3. Jaanewale Tera Khuda Hafiz – Lata. 4. 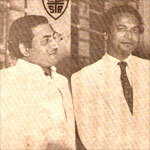 Palki Chali Gayi – Rafi & Mannadey. 5. Chehrese Apne Aap To – Happy vesion. 6. Chehrese Apne Aap To – Sad vesion. What a golden period of music it was? A greatest article on a greatest song!!! What else I can say? You really touched this melodious song with such a softness which it deserves. Only one dicrepancy: The song should also be embedded / attached with the article, as the same has become a ritual for this kind of articles. Gan Sharmaji ,magnificent article.Really great.kudos to you for your well expressed thoughts on this great composition.Shakeel Badayuni, Naushad and Mohammed Rafi sahab had created several super hit songs. That magnificent era ended,sadly. Mohan , congratulations on becoming part of larger audience. Rest elsewhere. Dear Mohan bhai, Did the song make you cry? Your passionate review of this lyrical gem brought tears, yes, but tears of joy, to me. Your loving outpouring is as poetic as the song you so soulfully described. 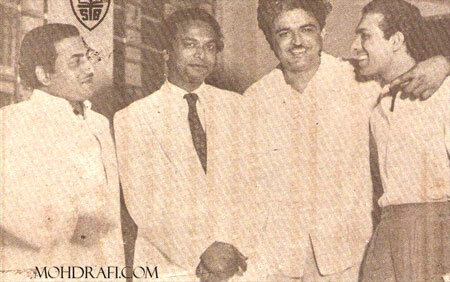 Shakeel, Naushad and Rafi saab created pure magic. While the entire song is beautiful poetry, the first line touches my heart the most __ Kal raat zindagi se mulaqat hogayi. This song goes to show why we all regard Rafi saab as the best. In the golden days, every verse was a creation, the poet would bear the birth pangs, in fact, for each word unlike today’s `worse’ where it is nothing but a jumble of words, lyrical nonsense. The music too was a painstaking effort where every note would be put in its proper place and tuned to suit the mood and situation. The singer would add more life and lustre to the creations of the poet and the music maestro. it was a collective, dedicated, loving and joyful effort. No wonder those masterpieces stir our souls even today. You have brought out all these aspects while juxtaposing them with today’s fast-paced life where everything almost everything is `created’ without emotion, life or soul. You are a wordsworth who touches people’s hearts. Because you write dil se. Thank you very much for this wonderful treat. Yeh dil maange more. The kindness of your comments is only matched by the grace of your writing: your comment (and similarly, your articles, write-ups and emails) are review-worthy themselves. I like your description of these masterpieces as creations, and I do not indulge in flattery when I describe your writings as examples of that as well. Thank you, Murty saab, for being a fellow Rafi fan, and for who you are. gan sharmaji first of all you deserve all the kudos for pouring your heart out on one of the greatest poetic creations of all times and explaining in your own way the niceties of almost each of the ‘alfaz’. that by itself is a painstaking effort. but then you are endowed with writing out your thoughts in such poetic facshion and it is therefore only apt that you should write on such a great song (i just cannot sum this up as a mere ‘song’, and revert back to my earlier reference of a ‘creation’). this is perhaps one of the several hundreds of instances when naushad sahab too would have been perplexed. the gayiki is simply incomprehensible and would rate as something being showered from the heavans. imagine, just imagine for once, did we ever have any other playback singer who could come anywhere even near the perfect blend of rendition that rafi sahab could dispense with. these are indeed craftly creations, sculpted to perfection to the last detail. such creations cannot be copied or imitated ever and they have the unmistakable stamp of the perfectionists. a fine poetry and a good composition can be lost if not supported equally by fine rendition. “kal raat zindagi se mulaqaat ho gayi” is therefore a benchmark of the highest order of composite creation. great expression in your thoughts too gan sharma ji and keep providing us with such insights on more of such masterpieces. what a description…wow….genius..i must say that NAUSHAD, SHAKEEL, RAFI are truly described by you. The depth of your knowledge and presentation are just unmatched. Compliments …for such a wonderful review..